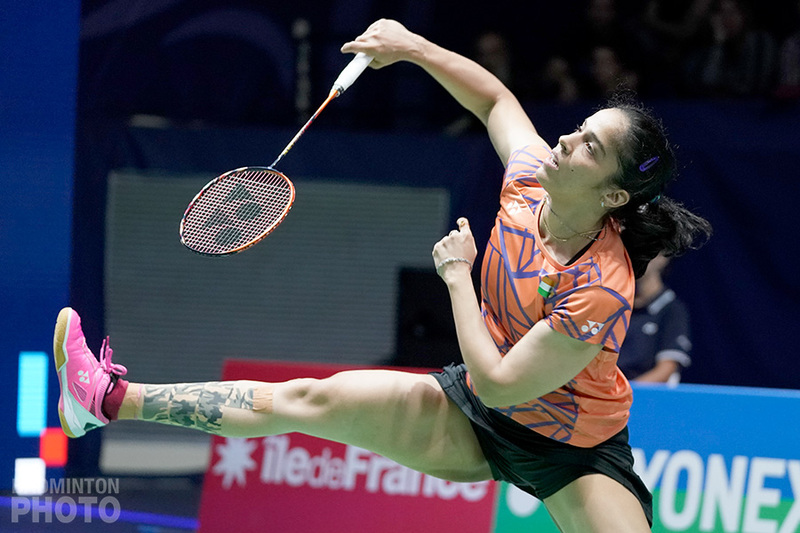 While many thought Saina Nehwal would not rise again after her knee injury at the 2016 Olympic Games, the Indian star is slowly finding back her former divine form to slowly join again the summit of the world rankings. Meanwhile, Korea has been facing severe adversity for the past few months but the badminton powerhouse is also slowly coming back as title contender on the world circuit. Coming back from a severe injury is, of course, never easy for anyone, but some get to recover much better than others from such an ill-fated event. Saina Nehwal (pictured) is indeed one of the special cases. The former world number one had set many records and earn multiple crowns before the Olympics in 2016, when she got admitted to a hospital in Hyderabad to undergo knee surgery, forcing the top star to stay far away from any badminton courts. “After my surgery in 2016, I came back and played too fast, not really believing that I could last long matches, but since the Asian Games I finally started to play my own strategies. It’s still not easy to get back to the rhythm but I’m still trying my best to cover it up as much as possible,” confessed the Indian shuttler. 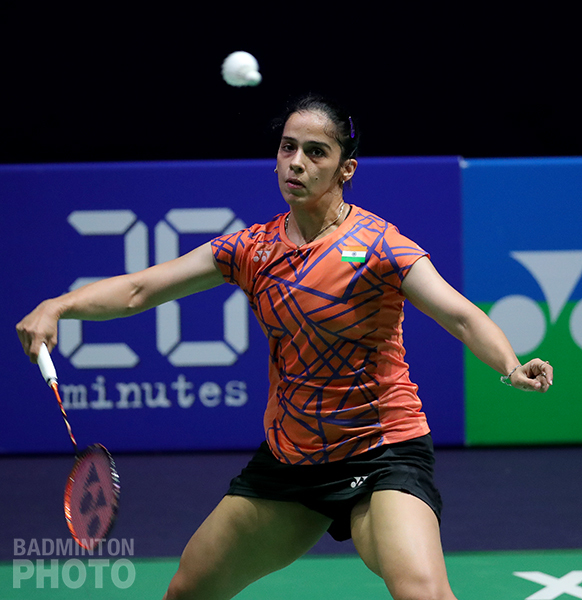 Following several great results, particularly a bronze medal at the Asian Games, the Commonwealth Games gold medal and a recent final at the Denmark Open, Saina Nehwal may finally rejoin the top eight in the world ranking to finally avoid all the big names from the very first round, though this can’t happen until early next year. “You know, when I see other people’s draws, I don’t get it – people ranked 29th, or 30th getting a comfortable draw and I get Tai Tzu Ying, Akane, Okuhara, etc. – but I sat down and told myself ‘No problem, no matter who I face I’ll fight,’ and still if you see my draw for the Hong Kong Open, I’m facing Akane Yamaguchi!” laughed Nehwal. A true fighter she is, and she proved that once more today, with a second victory in two weeks over none other than Nozomi Okuhara (pictured), the never-give-up Japanese player, in a fantastic three-game battle. 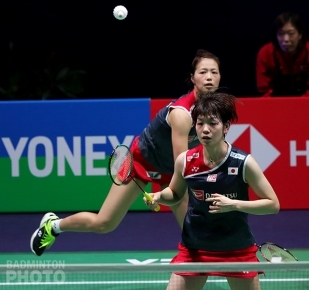 “At the Korea Open, I lost to Okuhara after leading 20–16 in the third game. Every loss obviously teaches you how to improve and come back stronger but definitely Okuhara is someone who is always fighting a lot and with a lot of power. That is why she was the World Champion last year. In the first game, I was a bit sluggish but luckily it all fell into place afterward,” said Saina Nehwal. With the whole team lacking good results over the past several months, the Korean doubles team seems back on track at the 2018Yonex French Open. With two women’s double pairs qualified for the quarter-final stage, one pair in particular notably excelled today in Paris. Chang Ye Na and Jung Kyung Eun (pictured right) defeated none other than the current world #1, Yuki Fukushima and Sayaka Hirota, the most consistent pair of the year so far. The Korean ladies developed a very clever game to counter attack the powerful game exhibited by the Japanese: “When we played them in Japan, we were playing well but without realising, we started making incomprehensible mistakes in the deciding game, but this time we came much more prepared and with a more aggressive game,” said Jung Kyung Eun. Grabbing the first game 21-12, the duo was on the way too finish off in two games, until the Japanese managed to find the loophole: “We tried using the safe method too much but it didn’t work well obviously. Luckily, we quickly changed our tactics in the third,” concluded Chang Ye Na. The Korean pair sealed the match after almost an hour and a half of exhausting play, winning 21-12, 17-21, 21-17. Another shining star from the Korean team, is by far the new combination of Seo Seung Jae and Chae Yoo Jung, the two youngsters that managed to achieve a final in New Zealand and to take the title in Australia at the very beginning of their partnership. The new pair still continues to sparkle in international events with a consecutive semi-finals, in Korean and then again last week in Denmark, and now they have reached the quarter-finals in Paris after a tremendous win over the world #5, Tang Chun Man and Tse Ying Suet from Hong Kong. “It’s a pair we’ve been following a lot of course, so we did a lot of research, and watched a lot of videos. I guess this is why we had an even better result against them this time,” analysed Seo Seung Jae. 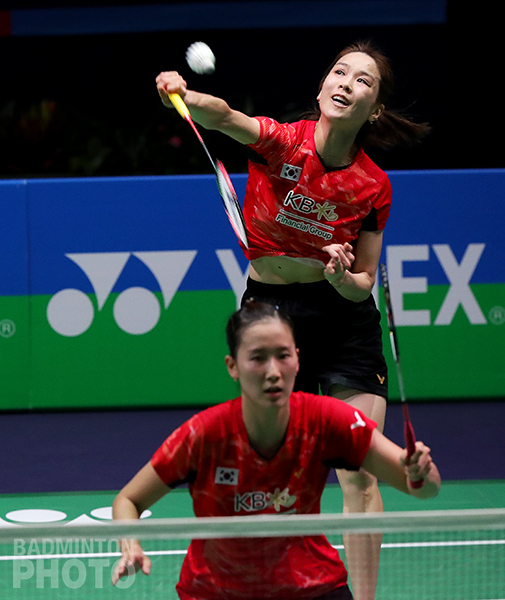 The young pair already defeated the seeded pair from Hong Kong, last Thursday in Odense, but Seo and Chae made sure this time to confirm their win in an more convincing way over their double-left-handed counterparts. “Yoo Jung helps me a lot on a daily basis. She does her best to fit my style and I try to do the same, I guess this is why our partnership is working better and better,” said the twenty-one year-old North Jeolla native Seo Seung Jae.